WITH no clear resolution on the contentious issue of forest convention in the final meeting of intergovernmental panel of forests (IPF) which met in February 1997, it was clear that the Rio + 5 summit of the world leaders would have to confront this proposal, pushed by a large section of the Northern nations. Negotiations on the issue dominated most of the sessions on forests. The Tanzanian spokesperson, who made a statement on behalf of G-77 also suggested that a legally binding treaty was just one of the options. The US, which too was not keen to have a legally binding treaty endorsed the G-77 proposal. However, the low-keyed statements by the G-77 also indicated that the group was not completely united in its position, with Malaysia and Indonesia along with Costa Rica and Papua New Guinea, wanting the convention while China was keen to keep its options open. In the actual negotiations, Papua New Guinea, a developing country, was found to be one of the strident proposers of the convention. The Netherlands became a spokesperson for the EU and took upon itself the aggressive role of pushing the convention. 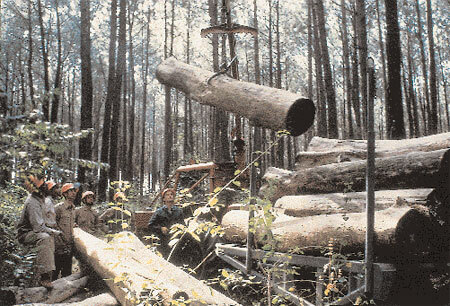 The country, which does not have any forest for logging purposes, and whose statements therefore have a moral uprightness, unlike other nations such as Canada and Finland (both timber-producing countries), saw in the forest convention an opportunity to become a leader on environment issues within the Northern block of countries. The country, along with Germany and Denmark, also kept saying that unless a forest convention was made, the conference would be a failure in the eyes of world. Tony Juniper of Friends of Earth-International, an NGO, opposing the forest convention in Europe stated that “EU wants a piece of paper to show off to the populations at home that they are very green.” The US, it is speculated does not want the convention as its timber industry fears global sanctions, and as such its opposition may be fuelled by its business interests. Thus as the first round of negotiations ended, it was unclear as to how the issue of forest convention would be resolved with opinions divided between and within Southern and Northern blocks and the G-77 not completely united in its stand. The question was, would the G-77 be able to ward off the financial bribe offered by EU and Scandinavian countries, considering the statements of financial constraints made by the G- 77 spokesperson from Tanzania and other southern delegations in achieving forest conservation. As the first round of negotiations ended without any explicit consensus, the co-chairs of the sessions, Margaretha de Boer, The Netherlands environment minister along with the Tanzanian minister of natural resources and tourism, Zakia Meghiji came out with a compromise proposal. De Boer loudly and aggressively tried to sell off the proposal to the negotiating delegates and told them, “You must accept the proposal, you will not find a better proposal.” However, one glance at the proposal showed that it was a pro-convention proposal. The proposal suggested a two-step approach, first step being identification of arrangements and mechanism and the second step being building of “consensus on the need of a legally binding instrument”. With negotiations to resume the next day, the corridors of the UN building became hectic points of lobbying. Several NGOs who had taken a strong exception to the compromise proposal issued by the Chairs were openly lobbying against the proposal with their country’s delegation members to oppose it stridently. EU and G-77 also had respective closed door meetings to discuss the proposal amongst themselves. The morning of June 26 , however saw far more polarisation in the debate than earlier, as several delegations took an exception to the aggressively partisan compromise text lobbied by the EU through the cochair De Boer. India’s negotiator, Vishwanathan Anand, secretary to the ministry of environment and forests (MEF), declared that the two-step formula was not acceptable to India as it prejudged the possibility of a convention. He stated, “We have a commitment to the people living in forests and periphery. Any kind of legally binding treaty would compromise their sovereign rights over forests. We are committed to protecting their rights.” The Tanzanian spokesperson for G-77 emphasised that the two-step formula settles the issue by favouring a legally binding treaty. Brazil and Columbia also endorsed the G-77 position. As the negotiations continued without much success of a common resolution, the EU led by Germany and Denmark’s minister of environment, Svend Auken, in a last ditch attempt to create pressure on the G-77 nations, openly threatened that they would not be able to make a financial commitment to implement any of the other IPF proposals for action, unless there was a clear agreement reached for a legally binding treaty. The US, which had been low-keyed till then recalled that no consensus had been reached in the G-7 Denver meet over the issue and that there are different views on how to achieve sustainable forestry, legally binding instrument being just one of them. As discussions led to an impasse, co-chair De Boer suggested a formation of a small closed group, which included representatives from India, Brazil, Columbia, EU, and Denmark to chart out another proposal for discussion. The closed group which met for four to five hours could not come to a consensus till late night, and the cochairs, led by De Boer formed another draft of a compromise proposal. The new draft, another clever pro-convention text, had inserted the words “identify and elaborate on the possible elements of and work towards consensus for international arrangements and mechanisms including a legally binding instrument.” The proposal was kept before the ministerial group working on forest for further discussion. In the short meeting that followed, the G-77 spokesperson suggested some amendments but did not tackle the above crucial phrase. As it was becoming late, De Boer decided to break and meet again. However, such were the pressure tactics played by the EU, that late at night, De Boer in a preempted declaration to the chair of the ad hoc Committee of the Whole, Tolba, said that her group had more or less reached consensus on the text on forests. The entire proconvention lobby broke then, into a big applause. With this, Tolba read out the text in the Committee of the Whole and kept it at ad referendum which meant that the text was now kept for final approval of the negotiating countries. However, as the US pointed out that the discussions were not yet complete, it was announced that the ministerial group would continue its discussion on the issue the next day. As the meeting reconvened the next day, the contentious word “including legally binding treaty” became a point of hot debate with India taking a lead. Finally the US compromise of replacing the word “including” with “for example” was accepted by all. Said Vishwanathan Anand, “We can now block the convention later.” However, the battle seems to be far from over. A new forum will be set up to continue further negotiations on the issue. 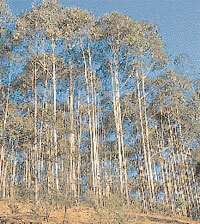 The US support has helped the Indian cause of blocking the forest convention for the time being. But the G-77 remains divided. Indian negotiators will now have to undertake the task of forging reliable allies within the G-77 on the issue.